Sometimes you need a quick fix – something you can do to feel good right now, in an instant, no thinking about it, no analyzing it, no working for it – just a good old fashioned “I NEED TO FEEL GOOD RIGHT NOW!” So what can you do? Last year I managed to get through the most difficult year of my life. Even as a spiritual teacher and a healer – someone who lives by all that I share and teach – there were days when I just wasn’t sure I would make it. Between the breakup of a relationship of sixteen years, the loss of my home, a move to a different part of the state, the death of one of my teenage kitties four months after that, followed by my other teenage kitty’s death four months later, and bronchitis and pneumonia between all that, followed by an adrenal crash of epic proportions… yes, there were times when all that I have learned, all that I know, all the guidance I’m blessed with, all the love and support from family members and friends, all the focusing on what I’m happy about and thankful for… all just sort of spun out of my field of vision, and I questioned whether I was holding on by my teeth or my toenails. So here are some things that got me through the most difficult year of my life. I’m still here. I’m still smiling. All that, and I’m OK.
1. Smile. No matter how bad you feel, no matter what’s going on around you, no matter who’s saying what to you when you’re going through a hard time, no matter how angry or enraged or bereaved you are feeling – smile. Acknowledge your feelings and smile anyway. Smile because you still draw breath, because you can move the muscles in your face, because you still have teeth when you may have lost everything else. Smile. I promise, you will feel better if you just smile. 2. Dance. Dance because you have legs to stand on. Dance because your feet still move you. 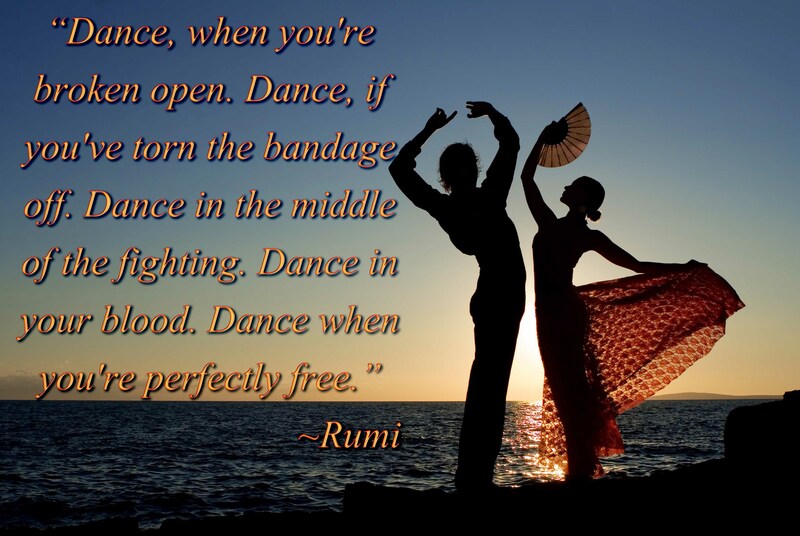 Dance because you can still stand without falling down. Dance because each step you take is one step closer to the light at the end of this tunnel. Dance your way through the tunnel. Dance because it feels good. Dance even if you can’t stand or have no legs or feet. Dance in your soul. If you’re in a part of the world that is snow-free (unlike here in Upstate NY at the moment), then take off those shoes and socks and dance barefoot in the grass. At least walk barefoot in the grass. It’s the most natural detoxification method in the world. 3. Breathe. Breathe because you are alive. Take a nice deep breath in. Don’t force it, don’t bother trying to control it, lengthen it, shorten it, huff & puff & blow something down… Just breathe. Just feel the breath coming into your lungs, down your windpipe, feel your belly expand with it, don’t try to breathe as deeply as you can… just breathe. Notice which nostril is open when you take the breath. Realize fully just how good it feels to breathe. 4. Cry. Cry because it’s your god-given way to release toxic levels of emotions. Cry because it’s cleansing. Cry because it feels good. And then replenish your water so you don’t get a headache. Cry it out. It’s OK. Cry because you don’t need to hold onto it anymore, and the tears wash it away and help you to let go. 6. Say no. If you don’t want to do it, just say no. It’s OK to set boundaries, it’s OK to say no. Sometimes, to feel good, you’ve just got to say no. And don’t pull the guilty talk on yourself either. If you need permission to say no, just give it to yourself. You are the only one whose place it is to give yourself permission to say no – so do it. Be three years old and enjoy getting to say NO! NO NO NO NO NO NO! without fear of punishment or retribution. Isn’t that liberating? Go ahead, right now, and call to mind a time when somebody wanted you to do something, and you didn’t want to, but you thought you couldn’t say no. Go back in your mind – or go forward, if that’s the case, and in this present moment, right now, go ahead and say “NO!” Feels good, doesn’t it? 7. Say yes. If you want to do it, say yes. It’s OK to give and do for others, and it helps you to feel good. Just don’t say yes unless you’re sure you really want to do it, otherwise you’re just giving your power away. Do what you want to do. If it’s something out of your comfort zone, something you would not normally do, give it a shot. Expand your horizons. Say yes. Oh, and say it out loud, right now, YES! It doesn’t have to be yes to anything in particular. Just say YES! right out loud and notice how your body feels. You feel good, don’t you. The very word “yes” is positive energy. But don’t think that means you shouldn’t say no. 8. Meditate. Just five minutes of turning your mind off and simply becoming the watcher of your thoughts is enough to help you to feel good right now. Relax and let your thoughts come and go. Don’t judge them. Or judge them, if that’s what helps you to feel good. The point is: just notice. Let whatever thought comes be OK, even if the thought is a judgment about the the thought you just had. It’s all OK.
9. Take a bath. Or a shower if you don’t have a bathtub. At the very least, life can feel really bad, but you won’t stink. 10. Think of one thing – just one thing – or one person (or pet) – that you are grateful for. Focus your thoughts on why you’re thankful for that thing or person or pet. Love coffee? Go ahead and give thanks. Your thanks is your blessing. How about thanking you? What for? For committing to feel good. For taking care of yourself. For being You. No matter how hard things may be, you matter, and you’re very much appreciated in this world, very much needed here and loved. What else do you do when you need to feel good now? Please leave a comment below, and let us know what works for you. How do you get through your rough times in life? Patricia Reed is a spiritual teacher, author, healer, trained as a practitioner of NLP, ThetaHealing®, Reiki, TFT®, EFT®, and Reconnective Healing®, empath, Divine channel, psychic, medium, and intuitive coach. Additionally, she is an expert in nutrition and mind-body-spirit detoxification. Thanks Stephanie 🙂 Glad to hear from you here & happy you like the suggestions. They helped me a lot!